City Of Sydney Braille — We Are BEST. A the truly unique and complex opportunity create a braille navigational map though all the streets of the City of Sydney, was a chance for BEST. to showcase the strength of our human movement and UX strategy team. When BEST. was presented with the truly unique opportunity to plan and wayfind a braille navigational map though all the streets of the City of Sydney, we were truly humbled by the importance and long lasting impact this project would have. 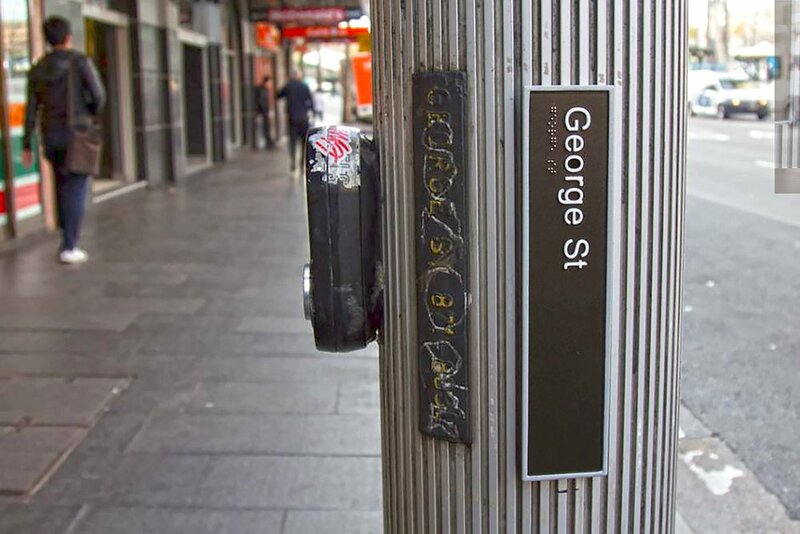 The project involved mapping out every corner post in the City of Sydney prescient, then apply braille street signs on each pole. These signs were specialty fabricated to fit each type of pole we came across and designed to last for an extended number of years under all kinds of conditions. Taking the opportunity to apply our depth of experience in design, mapping and project management and apply it to all the various complexities of this project was a true example of BEST’s relenting approach to get out and create new. We created a system of sand blasted cast alloy, that was then powder coated, which resulted in a cost saving for the project but now allows for small runs of single signs, so single signs can be replaced as needed in the future.